The state of a port is either open, filtered, closed, or unfiltered. A port is said to be open if an application on the target machine is listening for connections/packets on that port. In this article, we will explain four ways to check open ports and also will show you how to find which application is listening on what port in Linux. The flag -l tells netstat to print all listening sockets, -t shows all TCP connections, -u displays all UDP connections and -p enables printing of application/program name listening on the port. To print numeric values rather than service names, add the -n flag. You can also use grep command to find out which application is listening on a particular port, for example. $ sudo netstat -lntup | grep "nginx"
Alternatively, you can specify the port and find the application bound to, as shown. 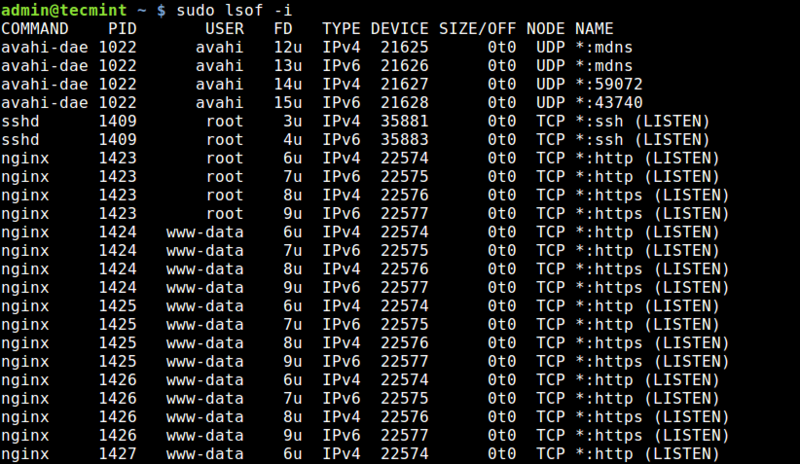 $ sudo netstat -lntup | grep ":80"
ss is another useful tool for displaying information about sockets. It’s output looks similar to that of netstat. The following command will show all listening ports for TCP and UDP connections in numeric value. Nmap is a powerful and popular network exploration tool and port scanner. To install nmap on your system, use your default package manager as shown. To scan all open/listening ports in your Linux system, run the following command (which should take a long time to complete). The final tool we will cover for querying open ports is lsof command, which is used to list open files in Linux. Since everything is a file in Unix/Linux, an open file may be a stream or a network file. To list all Internet and network files, use the -i option. Note that this command shows a mix of service names and numeric ports. To find which application is listening on a particular port, run lsof in this form. That’s all! In this article, we have explained four ways to check open ports in Linux. We also showed how to check which processes are bound upon particular ports.